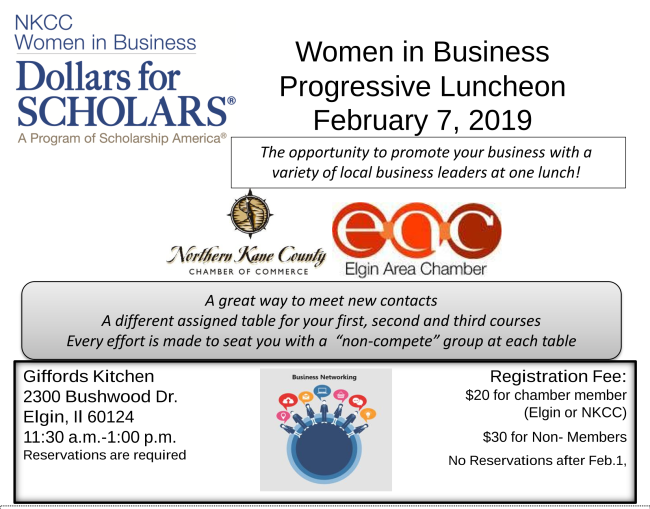 The Elgin Area Chamber of Commerce and Northern Kane County Chamber of Commerce invite you to join us and a variety of local business leaders on Thursday, February 7 from 11:30 a.m. to 1:00 p.m. for a Multi-Chamber Women in Business Progressive Luncheon. The event takes place at Gifford's Kitchen & Social, 2300 Bushwood Dr. in Elgin. For each lunch course you will be assigned a different table so you can easily increase your network by 10, 20, 30 or more contacts. Every effort is made to seat you with a non-competitive group at each table. Of course, bring a stack of business cards with you! Tickets are $20 each for Chamber members and $30 for non-members. Last year's event sold out. Register early! Please take advantage of this unique opportunity. We are unable to accomodate walk-ins at this event. Reservations are required and we are unable to accomodate anywalk-ins. $20 for Chamber members (Elgin or NKCC) and $30 for non-members. Cancellations 24 hours in advance of the event will be refunded.